A valid prescription is required to buy Evorel online. Conditions treated by Evorel®, Evorel Conti® and Evorel Sequi®. Evorel® patches come in a range of different strengths and combinations. Evorel, Evorel Conti and Evorel Sequi are patches that are applied to the skin. Evorel® patches contain Estradiol Hemihydrate (Estrogen) but do not contain any Progestins. Evorel Conti® and Evorel Sequi® patches contain Estradiol Hemihydrate but they also contain a Progestin called Norethisterone Acetate. Evorel is sold under various brand names like Femanest. Evorel® patches supply the body with missing hormones via the skin. Hormone patches like Evorel® are referred to as a type of hormone replacement therapy and is commonly prescribed to menopausal women to help reduce the symptoms of menopause. Many pills are available to treat menopause, Evorel® is the same, but in patch form so you don’t have to take it orally. Evorel® can reduce the severity of menopause symptoms like night sweats, hot flushes, vaginal dryness, vaginal itching and loss of bone density. It can also be prescribed to women who have been through a hysterectomy. After hysterectomy the body cannot produce the same amount of hormones as it did before so hormone replacement therapies need to supplement what’s left of the body’s natural hormone production allowing the body to perform functions similar to the pre-menopause years. Evorel® patches should be applied directly to dry skin. The ideal place for your Evorel® patch is in the area below the waist or on the thigh or bottom. Evorel® should not be placed on the arm or near the breasts. 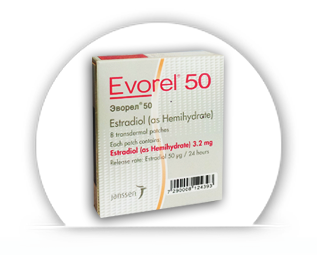 Unlike many hormone replacement pills, Evorel® does not need to be administered once a day. Your doctor will advise you on the dosage instructions according to your symptoms and personal circumstance. It’s normal to change the Evorel® patch twice a week without a break between patches but not always. Always follow the dosage instructions given to you by your doctor to make sure you get the correct treatment and levels of added hormones. Dosage instructions also depend on what strength and combination of Evorel® that you have been prescribed – there are a few strengths to choose from. Most women will be prescribed Evorel Conti® or Evorel Sequi®. Women with high progesterone levels of those who have had a hysterectomy are more likely to be prescribed Evorel® as the levels of Estradiol in it should be sufficient and there is no need for more Progestin (progesterone) to be added into the body. Evorel® is less likely to cause gastrointestinal side effects than other forms of hormone replacement therapy and Estradiol treatments. This is because it is not ingested. For this reason Evorel® is popular with women who suffer from IBS and other gastro sensitivities or diseases. Common side effects of Evorel® patch can include redness or itchiness where the patch is applied, breast tenderness, acne, changes in mood, heavy periods (if you are still experiencing them), headaches or insomnia. These side effects might only last for the few week or two of using Evorel® but they can last for longer. Let your doctor know about any side effects of Evorel®, Evorel Conti® or Evorel Sequi® regardless of how much they bother you. It’s important to make sure that the Evorel® side effects do not get worse. It is possible to experience more serious side effects, in which case, consult with your doctor or an emergency physician right away. You may need to stop using Evorel® patches and use a different form of hormone replacement therapy for menopause symptoms instead. Like all hormone treatments you should be very careful if you have, or have had, a history of high blood pressure, diabetes, cancer or heart disease. In some cases Evorel®, Evorel Conti® or Everol Sequi® might not be suitable. If you tell your doctor about all previous and current conditions they will be able to advise and confirm that taking Evorel® is OK for you and not dangerous. Evorel® can interact with other prescription medications, antibiotics and over the counter medications. Do not start taking new medications without consulting your doctor or pharmacist. Even though Evorel® is a patch and not ingested orally the result is the same – both forms of birth control and menopause treatments give your body added hormones. The only thing that is different is the method of delivery. The information about Evorel®, Evorel Conti® and Evorel Sequi® on this site is purely educational; it does not replace a doctor’s consultation.